2 Bonuses For Sports Lovers! Posted on Saturday, February 06, 2016 by "T". bet-52 is a world-class entertainment site where you will find everything you could possibly want to bet on, including Sports Betting, Live Betting, Casino, Live Casino, Pool Betting, Virtual Sports, Poker, and Financials Betting. The site, which was launched in 2014, has its license in Curacao and therefore accept players from most countries! 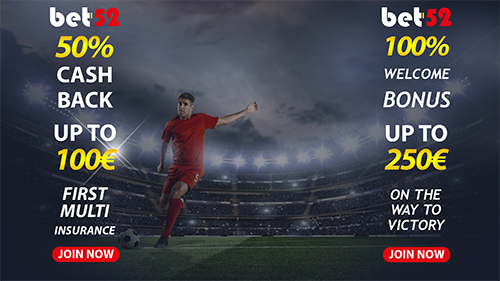 All new customers can choose between a 100% Up To €250 Deposit Bonus for sports betting and a Multi-Insurance 50% cashback up to €100 on their first bet! In other words, two great options for those who love to bet on sport events! 4 comments for "2 Bonuses For Sports Lovers!" truly spectacular offers that are available to us- regular mortals/mobbits from one of the best entertainment sites in the world: bet-52! i just cannot express my excitement when reading this news, not everyday one can feel so privileged and blessed, totally awesome offer, huge thanks for bet-52. cucarao licence might not actually be the biggest attraction to this wonderful, amazing and mesmerizing website known as bet-52. the name is! not bet-53 or bet-69, but bet-52... what an fantastic name showing deep intellect from the owners and all the people involved. true respect all around. I mean the website overll not bad if you could get over their stupid and slow live betting app but the fact itself - that they did not make the effort to apply for licence at a lot less shady place . is kinda turnoff for me... We'll see.